Below we have a few of our most commonly asked questions. Click the green bars to expand a section, revealing the relevant answer. We hope you can find the answers you're looking for here. If not, please feel free to call or email us! We'd be happy to answer your questions and receive suggestions for additional information on our website. Is the stone going to be a single or a double? That is, is it covering one cemetery space or two spaces? If two people are not being cremated, the answer is always two spots, meaning a double. If there is only one person, it will most likely be a single. If there are two people, and they are both cremated, it could go either way - some cemeteries allow two cremated individuals per plot. It all comes down to this: do you own one plot or two? What cemetery will we be putting this in? That's it! We can walk you through the rest when you come in. It's not required, but we do suggest you read through the rest of the FAQ so you don't feel overwhelmed during your consultation with one of our experts. There are a million and one variables when it comes to price. Size is the most obvious factor, but stone color plays a role as well. Red is the most expensive and black is second-most expensive. If you're on a budget, consider choosing a grey stone! Generally, design (either sandblasted or etching) will not considerably affect price unless the design is extremely custom. A black and white etching costs the same as a color etching, so keep that in mind! We'll start with lettering. The universal elements are first name, last name, date of birth, and date of death (we'll leave that one out if you're purchasing for yourself). Marriage dates are similarly common, and we have many marriage-related etchings that would frame and complement the dates perfectly. Other common elements are relationships. For example, "beloved wife and mother" or, "father and grandfather." We can also include maiden names and nicknames. The next most common element is design. We can incorporate sandblasted designs or etched designs. Sandblasted designs are less detailed designs which commonly frame or adorn the words of a stone. Etched designs are very detailed and look much more like traditional drawings. They can either be a small image (birds are very common choices) or a very large image which spans from one side of the stone to the other (we call these scenes). We use this method to create portraits and other custom work in addition to prefabricated designs we have available for viewing either online or in person. These can either be in color or black and white, and there is no additional charge for color. Portraits are typically done in black and white because color etchings of faces don't always translate the most gracefully. We aim to create beautiful images which last for as long as possible, so we generally encourage our patrons to agree on a black and white portraits. Etched designs work best on black stones, as black stones provide the greatest contrast and are therefore most legible. However, if you have a differently colored stone, we do have a solution - insets. In these cases, we put the engraving on a small circle or oval of black granite and then insert the black granite into the rest of the stone. See below for an example. When we say our etched designs are custom, we really aren't kidding. We encourage patrons to bring in meaningful photos which they may like to see on their or their loved ones' monuments. Common choices include portraits, houses, vehicles, farms, pets, and even toys, but the possibilities are endless. If you don't have a usable photo of an object, we'll even take one for you. If it's portable, bring it in and we can photograph it in-house. If it isn't (like a house) we'll even drive out and take a photo for you, provided it isn't too much of a hike. We've even driven hours for our clients, and would be happy to do the same for you. Are you running out of space yet? Not a problem - if you are purchasing a memorial (anything that comes considerably above the ground), we can put more on the back of the stone too. 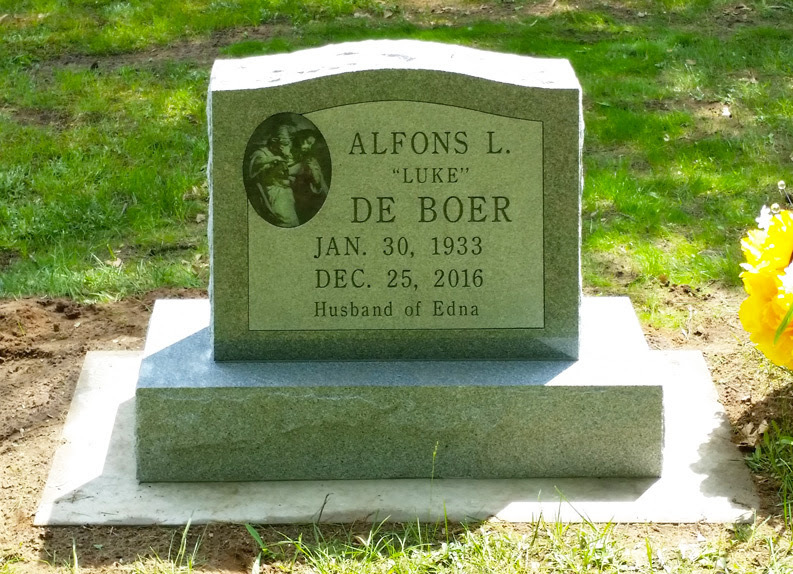 Some patrons have chosen to relocate their names to the back of the stone, generally as a result of cemetery layout. More commonly, many have chosen to display the names of their loved ones, such as children and grandchildren, on the back. The considerable space on the back of the stone can also lend itself very well to scenery or a veteran's marker, so that's another possibility to consider.